The rumors of President Donald Trump’s shady connections to Russia popped up even before he was elected in 2016. Since he took office, there have been numerous reports of Trump’s campaign and staff having mysterious meetings, conversations, and negotiations with Russian officials and liaisons. These reports have divided conservatives and liberals completely, with conservatives thinking that the Russia rumors are complete fabrications by those in the media who wish to destroy Trump. Liberals on the other hand believe that it’s possible that Trump himself is completely beholden to Russia and its ruthless leader Vladimir Putin. I believe the truth may be somewhere in between, but to me it has become very obvious that Trump’s relationship with Russia and Putin goes far beyond normal foreign diplomacy. Trump furthered those suspicions on Monday when he met privately with Putin. There were no other Americans present, and what was really discussed may never be known because Trump himself is the only one that can report on what happened in that meeting. For some conservatives, this meeting was something that was indefensible. It seems like it could be a new low for this presidential administration. Trump emerged from his summit with Putin in Helsinki, Finland on Monday to have a joint press conference with both leaders speaking. What followed was a stunning admission on Trump’s part that he believes the words of Putin over that of his own intelligence community. In 2017, former FBI Director Robert Mueller was appointed to the head of a Special Counsel investigation into alleged Russian meddling in the 2016 presidential election. The counsel has already indicted former Trump campaign officials Michael Flynn, Paul Manafort, George Papadopoulos, and Rick Gates. Last Friday, the counsel indicted 12 Russian intelligence officials who are accused of hacking the emails of the Democratic National Committee in 2016 and releasing them to the public to damage the reputation of presidential candidate Hillary Clinton. This was one of the first times the American people have gotten a better insight into exactly how the Russians meddled in the election. On Monday, Trump flatly sided with Putin and claimed he was sure that Russia had nothing to do with election interference. “The Russian state has never interfered, and is not going to interfere into internal American affairs, including in the election process,” Putin said. Of course, the American public exploded after this meeting, taking to social media to voice their concerns and criticisms over what was said at the press conference. What was more interesting to me was how some republicans who have been hesitant to criticize President Trump reacted. “The president must appreciate that Russia is not our ally,” House Speaker Paul Ryan (R-Wisconsin) said in a statement. “[Russia] remains hostile to our most basic values and ideals.” He added that there’s “No question” that Russia meddled in the 2016 election. Where our country goes from here is unclear. I’d say I’m encouraged by Republicans coming out to criticize our president for his brazen disregard for US intelligence officials, but unless they actually use the system of checks and balances that they’re in control of to rein in the president it will all just seem like hot air. This Russia thing has become so polarizing that it seems like many conservatives will just bury their head in the sand and go along with whatever Trump says as absolute gospel. It’s also up to liberals to be patient and not expect Mueller to slap handcuffs on Trump himself. This is going to be a long, drawn out process and the only way to get Trump out of office will probably be to go and vote in 2020. It’s not an easy answer, and it’s disheartening to see our democracy so closely tied to a regime in Russia that is murderous and tyrannical. For now though, it’s important to remember that the wheels of politics grind slowly. Nothing can happen overnight. If there really was collusion and interference that the Trump campaign participated in, all we can do is hope that one day it comes to light and justice is done. I have never hated being right more in my entire life. For months, I told family, friends, and really anyone who was interested in listening that Hillary Clinton was a deeply flawed candidate and that she would most likely lose the presidential election. Even though the Republican candidate for president was also deeply flawed, it didn’t matter because a lot of voters have a long-held grudge against Clinton. I don’t necessarily agree with their grudge, but I was never a huge supporter of Clinton in her presidential bids so it’s tough for me to defend her. Still, I was reading the polling data that said Clinton had a decent lead even though enthusiasm for her campaign was plummeting. On the morning of the election I finally thought to myself, “I guess I was wrong, but at least we won’t have Donald Trump as our president”. I was a supporter of Bernie Sanders during this election season, but I still much preferred Clinton to be president over Trump. Unfortunately, Clinton’s “Blue Wall” collapsed as states that normally went to the democrats switched sides. Trump won the election definitively through the electoral college, despite losing the popular vote. Even though a reality TV star was a candidate for president, people in America showed how much they really hate being ignored, and how much they hate Hillary Clinton. My concerns with Clinton started when the massive scandal about her private e-mail server started. I knew that it was a type of problem that doesn’t just go away. It was something that contained a ton of information, and when we found out that information had been stolen through a hack, the problem got even worse. Despite the fact that the FBI declined to prosecute Clinton, the scandal gave her opponents plenty of ammo to use against her. And she only hurt her cause more by staying silent and vague about it. In fact, ignoring people was a big problem with her campaign for over a year. Despite the hatred for Clinton, I don’t think it’s possible to point to one factor as the main reason Trump won the election. There were several factors that hurt Clinton’s chances and made Trump a more attractive choice to a lot of voters, despite his flaws and general vagueness on the issues. Clinton spent a lot of time privately strategizing with her team, rather than publicly answering questions. She went on a nine-month streak where she didn’t hold one press conference. That’s really a terrible look for a presidential candidate. She ignored key swing states like Wisconsin and Michigan, and it ultimately cost her the election. The Clinton team’s resources were dedicated in states like Ohio, Pennsylvania and North Carolina, and she won none of those states. So what happened to make voters go against her so wholeheartedly? One factor was the overwhelming support working class males and families showed for Trump. Some enthusiastic support came from working class families in those rustbelt states like Ohio, Michigan, Wisconsin and Pennsylvania. Those voters truly believe, right or wrong, that they’re being screwed over by the current state of the economy. Trump’s campaign was strong in this area: highlighting that he would manufacturing jobs back to America, lower the taxes of the working class, and strip away trade regulations. Trump of course has not produced a clear plan on how to do any of these things now that he’s been elected president, but that’s not surprising to most people that have followed him throughout this campaign. Trump doesn’t seem to plan for much, he just goes off how he’s feeling at the moment. Still, he rode that strategy all the way to the white house which is a truly amazing thing to think about. Speaking of Trump’s message, Clinton didn’t seem to want to counter it at all. She was content to point out all of Trump’s flaws, and there were a lot of them. She hammered him on his behavior towards women and the infamous Access Hollywood tape, but it didn’t matter to Trump supporters. He was speaking to them, she was just telling them he was bad. She needed to tell them more about actual policies, but with the e-mail scandal hanging over her head she tried to do whatever it took to not rock the boat. That scandal would be the undoing of Clinton. When FBI director James Comey announced that he might re-open the investigation into Clinton just 10 days before the election, it halted whatever momentum she had in the polls. The saddest part for liberals and Clinton supports alike is that she did it to herself. Clinton knew she was walking the line on many different security measures including the emails, she is a brilliant lawyer with decades of experience. She even asked Colin Powell, the outgoing Secretary of State who also used a private e-mail server, for advice on how to use the server. The scandal was a cloud that allowed Trump supporters to counter any positive claims about her with credible evidence of her participating in illegal activity and mishandling classified information improperly. With this kind of obstacle to overcome, the Clinton campaign was super careful about anything they did. They just assumed that people would hate Trump enough to vote for her. It didn’t happen, just like the DNC’s pre-planned victory celebration with Katy Perry and other celebrities didn’t happen. Then there was the issue of democrats not showing up to vote. Indeed, democratic voter turnout was way down from both the 2008 and 2012 elections. This was probably due to a lack of enthusiasm for Clinton, but there are also many disgruntled Bernie Sanders supporters out there like me. Even though I would’ve voted for Clinton if I lived in a swing state, I can totally understand why some liberals decided they just couldn’t cast a vote for her under any circumstances. 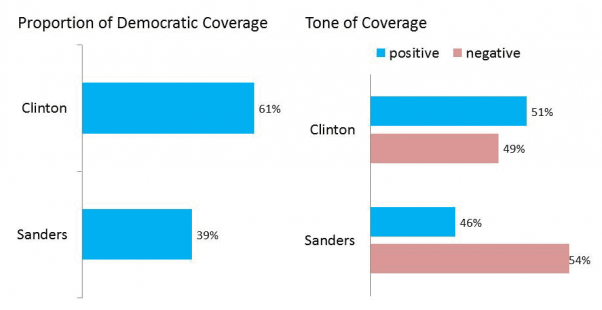 It always seemed like Sanders had the momentum and was more popular than Clinton. Because of those e-mails that just keep coming up, we now know that from day one of the campaign the DNC worked in several ways to take support away from Sanders and bring it to Clinton. No wonder some democrats were so bitter. The last thing I want to mention is the factor of so called “PC culture” on this election. Trump supporters on the internet will have you believe that they “Meme’d a man into the White House”, and while they were a factor I don’t think it’s as prominent as people think. The internet community was perhaps the most enthusiastic about Trump, diving deeper into the Clinton e-mails than any journalist did, and even using them to create their own conspiracy theories. In the end, the internet became the primary way for Trump supporters to not only share misinformation and fake news stories, but also a place for them to express uncensored, anonymous opinions on Clinton. In that way, the internet was a big factor, but I don’t think it swayed many voters. It does seem like there is some rebellion towards PC culture among the internet’s Trump fans, but it’s much less focused than the push was to get Trump to the White House. Mostly, I think the DNC should move away from using celebrities and musicians as advocates for their candidate. It is clear that there is some fatigue on the part of voters when it comes to being told how to think, especially by someone who they perceive to not be struggling at all. I can see how that would anger some people, and who really knows if there’s anyone out there that was convinced to vote for Clinton by Beyonce. It may not have been one factor that sunk Clinton’s campaign, but it’s clear now that with all these negative issues piling up, she needed to be much more bold in her campaign. Democrats suffered mightily because of this, not only losing the presidency, but control of the Senate as well. Now the Republicans will have the White House and Congress. The party really needs to understand that they failed the people in this election. There was a candidate that was clearly the favorite in the democratic primary, and the party ignored him because they believed it was somehow Clinton’s “Turn”. That attitude has to change. The party has also come too close to resembling the old Republican party. Corporate interests are now supremely important to BOTH parties, and it never used to be that way. Huge, fundamental changes are needed in the party’s structure if the democrats don’t want to face eight years of President Trump. In an election year featuring two politicians who are the two most unfavorably rated candidates in US presidential election history, the people who are supposed to inform us as a public are failing at their job. 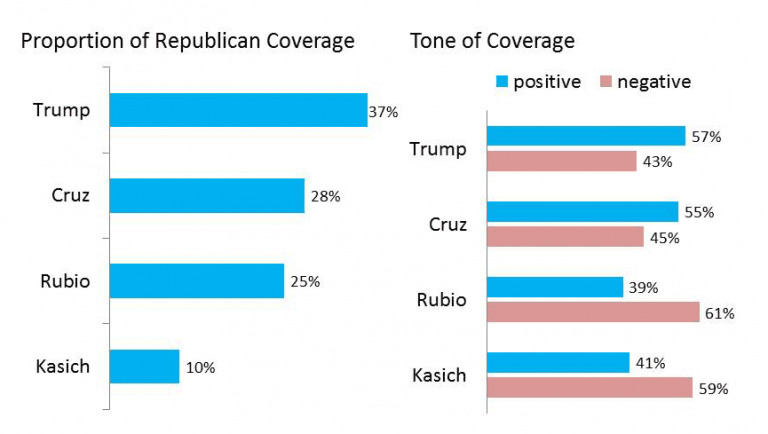 At the same time, Americans are consuming news differently or not at all, leading the candidates to find new ways to get their messages across. The result is a horrible mess of news coverage that shows no sign of stopping or changing in how it is presented. Recently released studies are now showing just how much the media is failing. However, due to the changing structure of media, their job isn’t just to inform anymore. The pursuit for ratings and page views have corrupted how the media covers events, especially something like an election, and now there’s proof of just how bad of a job they’re doing. There has been a big boom in the rise of social media, and other alternate forms of communication that the biggest media companies in the world have jumped on in hopes to transmit their message to more people around the world. However, the most popular forms of media remain to be those referred to as “Traditional media” like television, radio and newspapers. Even for those huge media companies that are trying to latch onto new media forms however they can, the public are still getting the bulk of their viewership through television, whether it’s cable or local news. A 2015 study by the American Press Institute found some alarming facts. 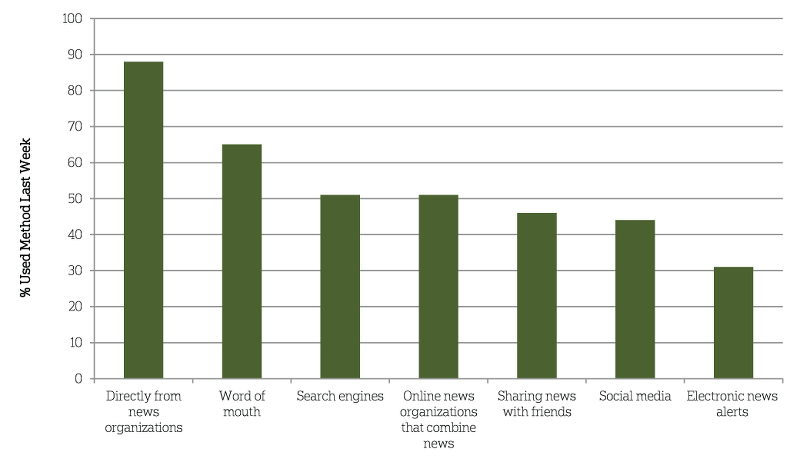 First, it found that many Americans don’t delve deep into news they do consume. Only about 40 percent of Americans surveyed in this study said that they spent time delving into news past headlines that they read, and even then it was usually later on in the evening when they consumed more news about stories they had heard earlier in the day. There are over 50 percent of Americans surveyed in this study that admitted they either just glanced at news headlines or consumed no news at all. That is alarming, but not exactly surprising. It is consistent with the percentage of people that stay home and don’t vote on election day. 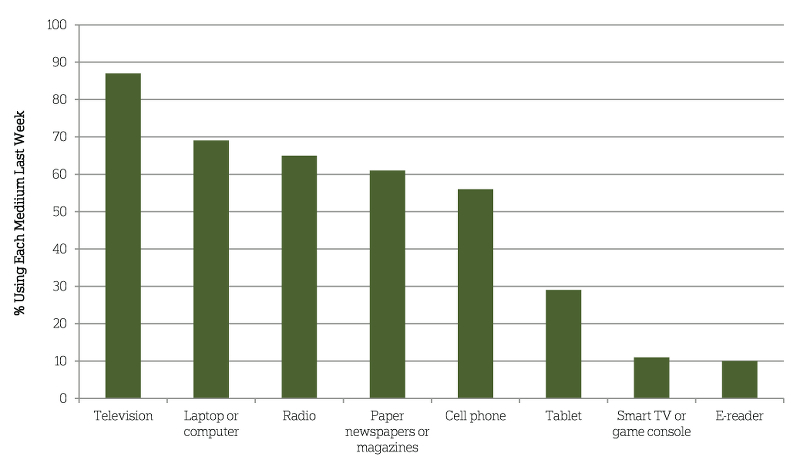 This study also showed that most Americans still rely heavily on television to provide them with all of their news. Although there are a lot more Americans using alternate devices to get news, almost 90 percent of those surveyed by the API said they get at least some news from television. In addition, almost 90 percent of Americans said they got most of their news directly from news organizations rather than other methods that may involve more effort or research. Check out these graphs below from the API for more information. While these graphs show an alarming trend in terms of a lack of equal coverage from the media, perhaps even more alarming is the Harvard study’s analysis of the actual content of the media. 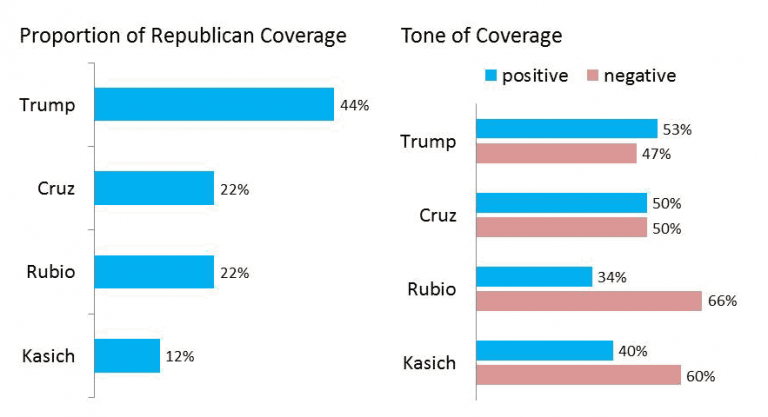 The study found that throughout the entire process of this election, the media has heavily covered campaign strategies, internal campaign conflict, winning and losing, or actual campaign competition. The Harvard study found that of all media coverage studied, only 11 percent of the media’s content covered actual policy positions, leadership qualities or personal and professional history. To me, this is simply astounding. The American media has become simply infatuated with covering Donald Trump, and they’ve also realized that doing so will result in their best television ratings possible. Additionally, the media has a seemingly never-ending obsession with making every story simple with one winner and one loser. The constant stream of coverage and need to declare someone a “winner” or “loser” even when there is no real contest like a primary going on has hurt the public, as well as these media company’s reputations. 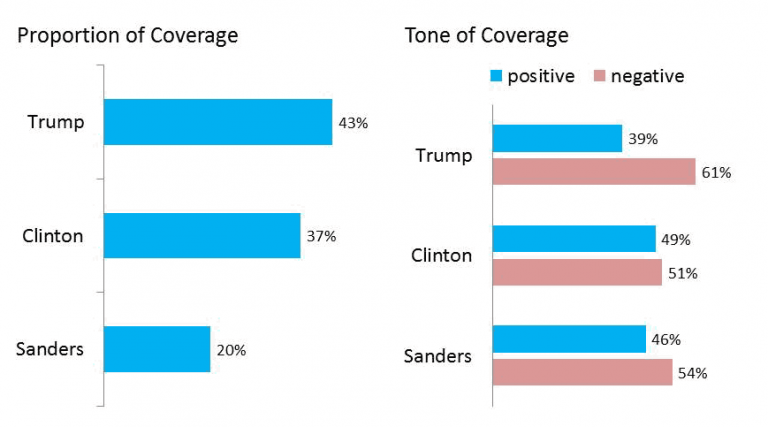 There is really no explanation for Trump getting more coverage than both Sanders and Clinton when those democrats were still locked in a primary battle. It is either bias, or sheer laziness by the media in that regard. With more and more news companies being parented by larger corporations, it has become apparent that ratings are a far more important priority to these news organizations than simply informing the public. We have long relied on the media to inform us, and keep us aware of all that’s going on in the world around us. It is unfortunate to say that I believe the media is now totally failing us in that regard. Of course, there are still many sources of news that are great, unbiased companies that have quality reporters. However, not many of those of those companies have an outlet on American TV. This article is not meant to inform you on what news you should read or watch, but if I had to make a suggestion I would say that BBC News-US and Canada edition is a good place to start. However, my main tip would be to just get news from many sources, and don’t just read one article or watch one story about a subject you are interested in. It takes time and effort to fully inform yourself on a subject, and a lack of time is what a lot of Americans face when it comes to consuming news. It is for this reason that many Americans look to television as their primary source for information. It is clear that in this regard, the news outlets that most Americans turn to for the purpose of information are completely failing to inform them. It will take a sea change in media to reverse this trend, and unfortunately I don’t know if that’s coming any time soon.